King's Acupuncture & Wellness Center has served the Buffalo area for over 30 years and treated more than 97,000 patients. Our new treatment center has five treatment rooms and is handicap accessible. For any information that isn't on our site, e-mail or call us. We will be happy to answer any questions you may have. Our email address is Kingsacupuncture@verizon.net and our phone is 716-688-1768. Click here for the latest King's Acupuncture QUARTERLY Newsletter. Click here to view our Monthly Qi (pronounced CHEE) Newsletter. 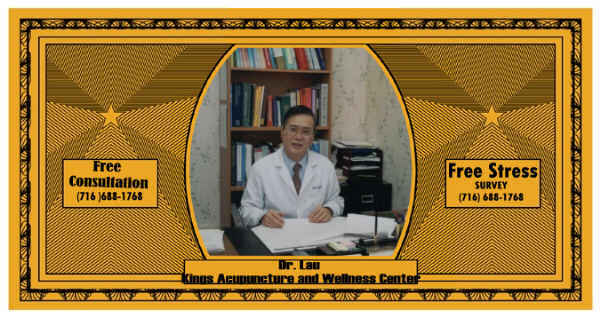 A coupon for a free consultation at King's Acupuncture can be printed here and literature is always available. New patients can print and complete a Health Questionnaire , Patient Authorization Form and sign our Office Policy and bring them to your first appointment. Our current staff welcomes you!